Historical materialism is a methodological approach to the study of human societies and their development over time that was first articulated by Karl Marx (1818–1883) as the materialist conception of history. It is principally a theory of history according to which the material conditions of a society's mode of production (its way of producing and reproducing the means of human existence or, in Marxist terms, the union of its productive capacity and social relations of production) fundamentally determine its organization and development. Historical materialism looks for the causes of developments and changes in human society in the means by which humans collectively produce the necessities of life. Social classes and the relationship between them, along with the political structures and ways of thinking in society, are founded on and reflect contemporary economic activity. Since Marx's time, the theory has been modified and expanded by Marxist writers. It now has many Marxist and non-Marxist variants. "In the Marxian view, human history is like a river. From any given vantage point, a river looks much the same day after day. But actually it is constantly flowing and changing, crumbling its banks, widening and deepening its channel. The water seen one day is never the same as that seen the next. Some of it is constantly being evaporated and drawn up, to return as rain. From year to year these changes may be scarcely perceptible. But one day, when the banks are thoroughly weakened and the rains long and heavy, the river floods, bursts its banks, and may take a new course. This represents the dialectical part of Marx's famous theory of dialectical (or historical) materialism." Historical materialism springs from a fundamental underlying reality of human existence: that in order for human beings to survive and continue existence from generation to generation, it is necessary for them to produce and reproduce the material requirements of life. Marx then extended this premise by asserting the importance of the fact that, in order to carry out production and exchange, people have to enter into very definite social relations, most fundamentally "production relations". However, production does not get carried out in the abstract, or by entering into arbitrary or random relations chosen at will. Human beings collectively work on nature but do not do the same work; there is a division of labor in which people not only do different jobs, but according to Marxist theory, some people live off the fruits of others' labor by owning the means of production. How this is accomplished depends on the type of society. Production is carried out through very definite relations between people. And, in turn, these production relations are determined by the level and character of the productive forces that are present at any given time in history. For Marx, productive forces refer to the means of production such as the tools, instruments, technology, land, raw materials, and human knowledge and abilities in terms of using these means of production. Writers who identify with historical materialism usually postulate that society has moved through a number of types or modes of production. That is, the character of the production relations is determined by the character of the productive forces; these could be the simple tools and instruments of early human existence, or the more developed machinery and technology of present age. The main modes of production Marx identified generally include primitive communism or tribal society (a prehistoric stage), ancient society, feudalism, and capitalism. In each of these social stages, people interact with nature and produce their living in different ways. Any surplus from that production is allotted in different ways. Ancient society was based on a ruling class of slave owners and a class of slaves; feudalism was based on landowners and serfs; and capitalism based on the capitalist class and the working class. The capitalist class privately owns the means of production, distribution and exchange (e.g., factories, mines, shops and banks) while the working class live by exchanging their socialized labor with the capitalist class for wages. Marx identified the production relations of society (arising on the basis of given productive forces) as the economic base of society. He also explained that on the foundation of the economic base there arise certain political institutions, laws, customs, culture, etc., and ideas, ways of thinking, morality, etc. These constituted the political/ideological superstructure of society. This superstructure not only has its origin in the economic base, but its features also ultimately correspond to the character and development of that economic base, i.e. the way people organize society is determined by the economic base and the relations that arise from its mode of production. The basis of human society is how humans work on nature to produce the means of subsistence. There is a division of labor into social classes (relations of production) based on property ownership where some people live from the labor of others. The system of class division is dependent on the mode of production. The mode of production is based on the level of the productive forces. Society moves from stage to stage when the dominant class is displaced by a new emerging class, by overthrowing the "political shell" that enforces the old relations of production no longer corresponding to the new productive forces. This takes place in the superstructure of society, the political arena in the form of revolution, whereby the underclass "liberates" the productive forces with new relations of production, and social relations, corresponding to it. "In the social production of their existence, men inevitably enter into definite relations, which are independent of their will, namely relations of production appropriate to a given stage in the development of their material forces of production. The totality of these relations of production constitutes the economic structure of society, the real foundation, on which arises a legal and political superstructure and to which correspond definite forms of consciousness. The mode of production of material life conditions the general process of social, political and intellectual life. It is not the consciousness of men that determines their existence, but their social existence that determines their consciousness. At a certain stage of development, the material productive forces of society come into conflict with the existing relations of production or — this merely expresses the same thing in legal terms — with the property relations within the framework of which they have operated hitherto. From forms of development of the productive forces these relations turn into their fetters. Then begins an era of social revolution. The changes in the economic foundation lead sooner or later to the transformation of the whole immense superstructure. In studying such transformations it is always necessary to distinguish between the material transformation of the economic conditions of production, which can be determined with the precision of natural science, and the legal, political, religious, artistic or philosophic — in short, ideological forms in which men become conscious of this conflict and fight it out. Just as one does not judge an individual by what he thinks about himself, so one cannot judge such a period of transformation by its consciousness, but, on the contrary, this consciousness must be explained from the contradictions of material life, from the conflict existing between the social forces of production and the relations of production." Perhaps the most influential recent defense of this passage, and of relevant Marxian and Marxist assertions, is G.A. Cohen's Karl Marx's Theory of History: A Defence. Many writers note that historical materialism represented a revolution in human thought, and a break from previous ways of understanding the underlying basis of change within various human societies. As Marx puts it, "a coherence arises in human history" because each generation inherits the productive forces developed previously and in turn further develops them before passing them on to the next generation. Further, this coherence increasingly involves more of humanity the more the productive forces develop and expand to bind people together in production and exchange. This understanding counters the notion that human history is simply a series of accidents, either without any underlying cause or caused by supernatural beings or forces exerting their will on society. This posits that history is made as a result of struggle between different social classes rooted in the underlying economic base. Broadly, the importance of the study of history lies in the ability of history to explain the present. John Bellamy Foster asserts that historical materialism is important in explaining history from a scientific perspective, by following the scientific method, as opposed to belief-system theories like Creationism and Intelligent Design, which do not base their beliefs on verifiable facts and hypotheses. While the "historical" part of historical materialism does not cause a comprehension problem (i.e., it means the present is explained by analysing the past), the term materialism is more difficult. Historical materialism uses "materialism" to make two separate points, where the truth or falsehood of one point does not affect the others. Firstly, there is metaphysical or philosophical materialism, in which matter-in-motion is considered primary and thought about matter-in-motion, or thought about abstractions, secondary. Secondly, there is the notion that economic processes form the material base of society upon which institutions and ideas rest and from which they derive. While the economy is the base structure of society, it does not follow that everything in history is determined by the economy, just as every feature of a house is not determined by its foundations. Thus, there is the idea that in the capitalist mode of production the behaviour of actors in the market economy (means of production, distribution and exchange, the relations of production) plays the major role in configuring society. In his analysis of the movement of history, Marx predicted the breakdown of capitalism, and the establishment in time of a communist society in which class-based human conflict would be overcome. 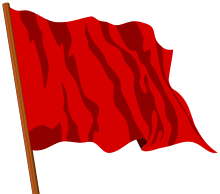 The means of production would be held in the common ownership and used for the common good. In the mention of "human liberation" one should not neglect that, in the level of production, solely the working class is the most oppressed. But either way in the prediction of the future, one shall first know of the past (i.e. the establishment of capitalism and the transitional part of feudalism). "Society does not consist of individuals, but expresses the sum of interrelations, the relations within which these individuals stand." Humans are inevitably involved in production relations (roughly speaking, economic relationships or institutions), which constitute our most decisive social relations. Production relations progress, with a degree of inevitability, following and corresponding to the development of the productive forces. Relations of production help determine the degree and types of the development of the forces of production. For example, capitalism tends to increase the rate at which the forces develop and stresses the accumulation of capital. Both productive forces and production relations progress independently of mankind's strategic intentions or will. The superstructure—the cultural and institutional features of a society, its ideological materials—is ultimately an expression of the mode of production (which combines both the forces and relations of production) on which the society is founded. Every type of state is a powerful institution of the ruling class; the state is an instrument which one class uses to secure its rule and enforce its preferred production relations (and its exploitation) onto society. State power is usually only transferred from one class to another by social and political upheaval. When a given style of production relations no longer supports further progress in the productive forces, either further progress is strangled, or 'revolution' must occur. The actual historical process is not predetermined but depends on the class struggle, especially the organization and consciousness of the working class. Hunter-gatherer societies were structured so that the economic forces and the political forces were one and the same. The elements of force and relation operated together, harmoniously. In the feudal society, the political forces of the kings and nobility had their relations with the economic forces of the villages through serfdom. The serfs, although not free, were tied to both forces and, thus, not completely alienated. Capitalism, Marx argued, completely separates the economic and political forces, leaving them to have relations through a limiting government. He takes the state to be a sign of this separation—it exists to manage the massive conflicts of interest which arise between classes in all those societies based on property relations. 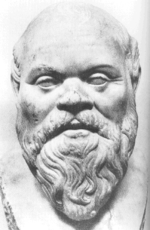 Marx's attachment to materialism arose from his doctoral research on the philosophy of Epicurus, as well as his reading of Adam Smith and other writers in classical political economy. Historical materialism builds upon the idea that became current in philosophy from the sixteenth to eighteenth centuries that the development of human society has moved through a series of stages, from hunting and gathering, through pastoralism and cultivation, to commercial society. Friedrich Engels wrote: "I use 'historical materialism' to designate the view of the course of history, which seeks the ultimate causes and the great moving power of all important historic events in the economic development of society, in the changes in the modes of production and exchange, with the consequent division of society into distinct classes and the struggles of these classes." Marx himself took care to indicate that he was only proposing a guideline to historical research (Leitfaden or Auffassung), and was not providing any substantive "theory of history" or "grand philosophy of history", let alone a "master-key to history". Numerous times, he and Engels expressed irritation with dilettante academics who sought to knock up their skimpy historical knowledge as quickly as possible into some grand theoretical system that would explain "everything" about history. To their great annoyance, the materialist outlook was used as an excuse for not studying history. In the 1872 Preface to the French edition of Das Kapital Vol. 1, Marx also emphasised that "There is no royal road to science, and only those who do not dread the fatiguing climb of its steep paths have a chance of gaining its luminous summits". Reaching a scientific understanding was hard work. Conscientious, painstaking research was required, instead of philosophical speculation and unwarranted, sweeping generalizations. But having abandoned abstract philosophical speculation in his youth, Marx himself showed great reluctance during the rest of his life about offering any generalities or universal truths about human existence or human history. The first explicit and systematic summary of the materialist interpretation of history published, Anti-Dühring, was written by Friedrich Engels. "[...] If Russia is tending to become a capitalist nation after the example of the Western European countries, and during the last years she has been taking a lot of trouble in this direction—she will not succeed without having first transformed a good part of her peasants into proletarians; and after that, once taken to the bosom of the capitalist regime, she will experience its pitiless laws like other profane peoples. That is all. But that is not enough for my critic. He feels himself obliged to metamorphose my historical sketch of the genesis of capitalism in Western Europe into an historico-philosophic theory of the marche generale imposed by fate upon every people, whatever the historic circumstances in which it finds itself, in order that it may ultimately arrive at the form of economy which will ensure, together with the greatest expansion of the productive powers of social labor, the most complete development of man. But I beg his pardon. (He is both honouring and shaming me too much.)" Marx goes on to illustrate how the same factors can in different historical contexts produce very different results, so that quick and easy generalizations are not really possible. To indicate how seriously Marx took research, it is interesting to note that when he died, his estate contained several cubic metres of Russian statistical publications (it was, as the old Marx observed, in Russia that his ideas gained most influence). But what is true is that insofar as Marx and Engels regarded historical processes as law-governed processes, the possible future directions of historical development were to a great extent limited and conditioned by what happened before. Retrospectively, historical processes could be understood to have happened by necessity in certain ways and not others, and to some extent at least, the most likely variants of the future could be specified on the basis of careful study of the known facts. Towards the end of his life, Engels commented several times about the abuse of historical materialism. "And if this man (i.e., Paul Barth) has not yet discovered that while the material mode of existence is the primum agens this does not preclude the ideological spheres from reacting upon it in their turn, though with a secondary effect, he cannot possibly have understood the subject he is writing about. (...) The materialist conception of history has a lot of [dangerous friends] nowadays, to whom it serves as an excuse for not studying history. Just as Marx used to say, commenting on the French "Marxists" of the late 70s: "All I know is that I am not a Marxist." (...) In general, the word "materialistic" serves many of the younger writers in Germany as a mere phrase with which anything and everything is labeled without further study, that is, they stick on this label and then consider the question disposed of. But our conception of history is above all a guide to study, not a lever for construction after the manner of the Hegelian. All history must be studied afresh, the conditions of existence of the different formations of society must be examined individually before the attempt is made to deduce them from the political, civil law, aesthetic, philosophic, religious, etc., views corresponding to them. Up to now but little has been done here because only a few people have got down to it seriously. In this field we can utilize heaps of help, it is immensely big, anyone who will work seriously can achieve much and distinguish himself. But instead of this too many of the younger Germans simply make use of the phrase historical materialism (and everything can be turned into a phrase) only in order to get their own relatively scanty historical knowledge — for economic history is still in its swaddling clothes! — constructed into a neat system as quickly as possible, and they then deem themselves something very tremendous. And after that a Barth can come along and attack the thing itself, which in his circle has indeed been degraded to a mere phrase." "...there is only one other point lacking, which, however, Marx and I always failed to stress enough in our writings and in regard to which we are all equally guilty. That is to say, we all laid, and were bound to lay, the main emphasis, in the first place, on the derivation of political, juridical and other ideological notions, and of actions arising through the medium of these notions, from basic economic facts. But in so doing we neglected the formal side — the ways and means by which these notions, etc., come about — for the sake of the content. This has given our adversaries a welcome opportunity for misunderstandings, of which Paul Barth is a striking example." "We, at that time, were all materialists, or, at least, very advanced free-thinkers, and to us it appeared inconceivable that almost all educated people in England should believe in all sorts of impossible miracles, and that even geologists like Buckland and Mantell should contort the facts of their science so as not to clash too much with the myths of the book of Genesis; while, in order to find people who dared to use their own intellectual faculties with regard to religious matters, you had to go amongst the uneducated, the "great unwashed", as they were then called, the working people, especially the Owenite Socialists". In a foreword to his essay Ludwig Feuerbach and the End of Classical German Philosophy (1886), three years after Marx's death, Engels claimed confidently that "In the meantime, the Marxist world outlook has found representatives far beyond the boundaries of Germany and Europe and in all the literary languages of the world." In his old age, Engels speculated about a new cosmology or ontology which would show the principles of dialectics to be universal features of reality. He also drafted an article on The Part Played by Labour in the Transition from Ape to Man, apparently a theory of anthropogenesis which would integrate the insights of Marx and Charles Darwin. (This is discussed by Charles Woolfson in The Labour Theory of Culture: a Re-examination of Engels Theory of Human Origins). "Capital is a tough nut to crack, opined Ignacy Daszyński, one of the best known socialist "people's tribunes" around the turn of the 20th century, but anyhow he had not read it. But, he said, Karl Kautsky had read it, and written a popular summary of the first volume. He hadn't read this either, but Kazimierz Kelles-Krauz, the party theoretician, had read Kautsky's pamphlet and summarised it. He also had not read Kelles-Krauz's text, but the financial expert of the party, Hermann Diamand, had read it and had told him, i.e. Daszynski, everything about it". After Vladimir Lenin's death in 1924, Marxism was transformed into Marxism-Leninism and from there to Maoism or Marxism-Leninism-Mao Zedong Thought in China which some regard as the "true doctrine" and others as a "state religion". In the early years of the 20th century, historical materialism was often treated by socialist writers as interchangeable with dialectical materialism, a formulation never used by Friedrich Engels however. According to many Marxists influenced by Soviet Marxism, historical materialism is a specifically sociological method, while dialectical materialism refers to a more general, abstract, philosophy. The Soviet orthodox Marxist tradition, influential for half a century, based itself on Joseph Stalin's pamphlet Dialectical and Historical Materialism and on textbooks issued by the "Institute of Marxism-Leninism of the Central Committee of the Communist Party of the Soviet Union". Several scholars have argued that historical materialism ought to be revised in the light of modern scientific knowledge. Jürgen Habermas believes historical materialism "needs revision in many respects", especially because it has ignored the significance of communicative action. Göran Therborn has argued that the method of historical materialism should be applied to historical materialism as intellectual tradition, and to the history of Marxism itself. In the early 1980s, Paul Hirst and Barry Hindess elaborated a structural Marxism interpretation of historical materialism. Regulation theory, especially in the work of Michel Aglietta draws extensively on historical materialism. Spiral dynamics shows similarities to historical materialism. Philosopher of science Karl Popper, in his Conjectures and Refutations, critiqued such claims of the explanatory power or valid application of historical materialism by arguing that it could explain or explain away any fact brought before it, making it unfalsifiable. In his 1940 essay "On the Concept of History," scholar Walter Benjamin compares historical materialism to The Turk, an 18th-century device which was promoted as a mechanized automaton which could defeat skilled chess players but actually concealed a human who controlled the machine. Benjamin suggested that, despite Marx's claims to scientific objectivity, historical materialism was actually quasi-religious. Like the Turk, wrote Benjamin, "[t]he puppet called 'historical materialism' is always supposed to win. It can do this with no further ado against any opponent, so long as it employs the services of theology, which as everyone knows is small and ugly and must be kept out of sight." Benjamin's friend and colleague Gershom Scholem would argue that Benjamin's critique of historical materialism was so definitive that, as Mark Lilla would write, "nothing remains of historical materialism [...] but the term itself. It is important to note, however, that Benjamin was arguing against a mechanistic form of historical materialist explanation then prevalent in Stalin's Russia, and was himself a committed, if unorthodox, Marxist. Later in "On the Concept of History," he writes: "Class struggle, which for a historian schooled in Marx is always in evidence, is a fight for the crude and material things without which no refined and spiritual things could exist. ... There is no document of culture which is not at the same time a document of barbarism. And just as such a document is never free of barbarism, so barbarism taints the manner in which it was transmitted from one hand to another. The historical materialist therefore dissociates himself from this process of transmission as far as possible. He regards it as his task to brush history against the grain." Underlying the dispute among historians are the different assumptions made about the definition or concept of "history" and "historiography". Different historians take a different view of what it is all about, and what the possibilities of historical and social scientific knowledge are. ↑ Seligman 1901, p. 613: "This doctrine is often called 'historical materialism,' or the 'materialistic interpretation of history.' Such terms are, however, lacking in precision. If by materialism is meant the tracing of all changes to material causes, the biological view of history is also materialistic. Again, the theory which ascribes all changes in society to the influence of climate or to the character of the fauna and flora is materialistic, and yet has little in common with the doctrine here discussed. The doctrine we have to deal with is not only materialistic, but also economic in character; and the better phrase is not the 'materialistic interpretation,' but the 'economic interpretation' of history." ↑ Seligman 1901, p. 163. ↑ K. Marx, A Contribution to the Critique of Political Economy, Progress Publishers, Moscow, 1977, with some notes by R. Rojas. ↑ G.A. Cohen (1978, 2000), Karl Marx's Theory of History: A Defence, Princeton and Oxford. ↑ Karl Marx and Frederick Engels, Selected Works in One Volume (London: Lawrence and Wishart, 1968), p. 660. ↑ Foster, John Bellamy; Clark, Brett (2008). Critique of Intelligent Design: Materialism versus Creationism from Antiquity to the Present. Monthly Review Press. ISBN 978-1583671733. ↑ "Historical Materialism is a theory that privileges the economic in explanation of non". Marxmail.org. Retrieved 2011-12-07. 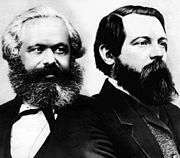 ↑ "Letters: Marx-Engels Correspondence 1890". Marxists.org. Retrieved 2011-12-07. ↑ "Letters: Marx-Engels Correspondence 1893". Marxists.org. Retrieved 2011-12-07. ↑ Frederick Engels. "Socialism: Utopian and Scientific (Introduction - Materialism)". Marxists.org. Retrieved 2011-12-07. ↑ Frederick Engels. "Ludwig Feuerbach and the End of Classical German Philosophy — Foreword". Marxists.org. Retrieved 2011-12-07. ↑ "The Part Played by Labor in the Transition From Ape to Man". Marxists.org. Retrieved 2011-12-07. ↑ "de beste bron van informatie over rote ruhr uni. Deze website is te koop!". rote-ruhr-uni.org. 2011-01-02. Retrieved 2011-12-07. ↑ Mark Lilla, "The Riddle of Walter Benjamin" in The New York Review of Books, May 25, 1995. Stefan Gandler, Critical Marxism in Mexico: Adolfo Sánchez Vázquez and Bolívar Echeverría, Leiden/Boston, Brill Academic Press, 2015. Justin Holt, The Social Thought of Karl Marx, Sage, 2015. Provides an introductory chapter on historical materialism. Anton Pannekoek, Materialism And Historical Materialism. Karl Popper, The Poverty of Historicism, attacks the notion that the study of history can be used to predict the future. ↑ Z A Jordan. "The Origins of Dialectical Materialism by Z. A. Jordan". Marx Myths. Retrieved 2011-12-07. ↑ "Franz Mehring: On Historical Materialism (1893)". Marxists.org. 2004-02-27. Retrieved 2011-12-07. ↑ "George Novack Internet Archive". Marxists.org. 2009-06-23. Retrieved 2011-12-07.